Restore Good Credit, Insurance and Home Improvements: Who do you know with less than perfect credit? Have them call 301-259-1721 Today! Retain or establish good credit. Protect your home and get affordable insurance products. 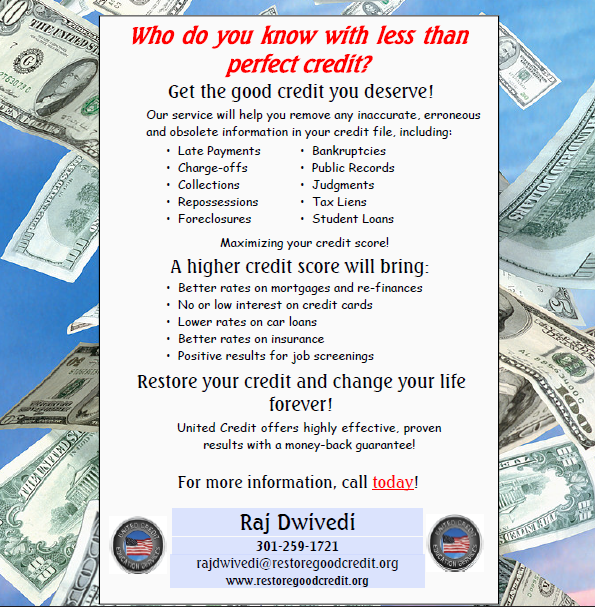 Call Dwivedi Consulting at 301-892-0207.
Who do you know with less than perfect credit? Have them call 301-259-1721 Today! Get the good credit you deserve! Our service will help you remove any inaccurate, erroneous and obsolete information in your credit file including late payments, charge offs, collections, repossessions, foreclosures, bankruptcies, public records, judgments, tax liens, student loans. Maximizing your credit score. A higher credit score will bring better rates on mortgages or refinances, no or low interest on credit cards, lower rates on car loans, better rates on insurance, positive results for job screenings and security clearance. Restore your credit and change your life forever! www.RestoreGoodCredit.org offers highly effective, proven results with a money-back guarantee! For more information, call Raj Dwivedi today at 301-259-1721. Need Affordable Professional Legal Advice? Got $20? Try These Guys! (c) Copyright 2012 Raj Dwivedi. All rights reserved.. Simple theme. Powered by Blogger.